WE PRIDE OURSELVES WITH A JOB WELL DONE. 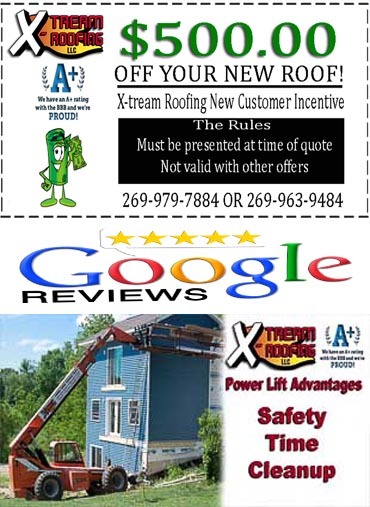 X-tream Roofing (Extreme Roofing) has 30 years of experience being a roofing contractor in Battle Creek Michigan. We are trained and Certified in both Lead and Asbestos abatement. Our goal is always premium craftsmanship and Customer Satisfaction. According to recent research, a new or replacement roof has one of the strongest impacts on your home's value of any home improvement project. .
X-tream's friendly design staff will help in selecting from the largest color selections available for lifetime vinyl siding. See how you can save money and add comfort to your home with CertainTeed fiberglass blown insulation. Sometimes called a pole barn can really add to your property. Want to add a garage or barn? We have the designs that can do it for you affordably. MY SINCERE THANKS FOR A GREAT JOB AND ESPECIALLY FOR GETTING IT DONE SO QUICKLY. I HAD HARDLY HOPED THAT YOU WOULD BE ABLE TO FIT ME INTO YOUR SCHEDULE SO QUICKLY. IT LOOKS WONDERFUL AND NOT ONE SCRAP OF ANYTHING LEFT BEHIND IN THE YARD! PLEASE EXTEND MY THANKS TO EVERYONE INVOLVED; I APPRECIATE ALL OF YOU. YOU CREATED ONE VERY HAPPY AND SATISFIED CUSTOMER. I WILL CERTAINLY RECOMMEND YOU TO OTHERS. XTREAM ROOFING WAS FABULOUS TO WORK WITH! VERY PROFESSIONAL! STUCK WTH THEIR WORK! MADE SURE WE WERE SATISFIED EVERY STEP OF THE WAY! CLEANED UP! WOULD HIGHLY RECOMMEND THEM TO ANYONE LOOKING FOR ROOFING OR SIDING! THE CREW WAS VERY PROFESSIONAL AND KEPT US UP TO DATE AND. HOW THEY WERE GOING CORRECT UNFORESEEN PROBLEMS. WHEN DONE EVERYTHING WAS REPLACED. Get the most out of your roof! Our skilled commercial roofing contractors have been serving Michagan for more than 30 years. Contact us today. Sunrooms, Decks and Patios are trouble free and warm using CertainTeed products. We offer good pay for hard work.